Want to read a moving novel in sonnets? Grab a copy of "The Golden Gate", by Vikram Seth. I am prejudiced against "popular" Indian authors. Past experiences have made me critical towards them, especially if their fiction is popular in the West. I don't know what I was thinking when I picked up "The Golden Gate" by Vikram Seth. I had heard of Vikram Seth, but I had not read anything by him. 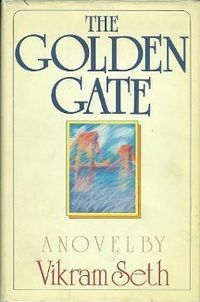 The Golden Gate is a story about a few friends, and a few years of their life. The book is written entirely in verse, which took me by surprise. It has been a few years since I read verse. I need not have worried, the Golden Gate is a great way to start reading verse again. It is easy to read, and many passages in it are moving, and thought provoking. The book starts out with a person who should be happy at his success, but he feels lonely. It follows his journey, and tells you about his friends, and their lives. Written during the turbulent period of the Vietnam era, it raises interesting questions about life, ambition, following one's dreams, and what it takes to be happy and at peace. The locations are all from the San Francisco Bay Area: San Francisco, San Jose, Marin county, and introduce the reader to the joy of living in this wonderful part of the world. It makes the reader appreciate the world we live in, and our friends. I started out skeptical, and ended up enjoying the book immensely. I was sad when it ended, Vikram had done such a fine job of introducing the characters that they felt like friends. Get the book, and enter the charming world of Vikram Seth's verse.